Moncton, New Brunswick – I have been camping at the current blockade along highway 134 since the inception of the encampment, filing almost daily reports for the Media Coop. During June and July of this year, when protests against shale gas exploration in New Brunswick were of far less national interest, I was doing the same. Around 6am yesterday morning, October 17th, RCMP forces again blocked off both sides of the anti-shale gas encampment along highway 134, this time with an as yet unseen amount of police force. 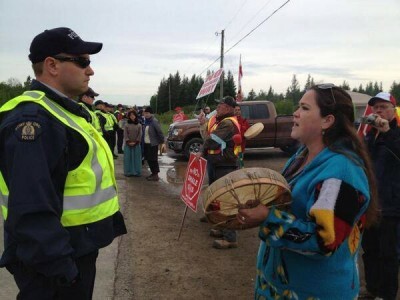 For numerous days prior, RCMP were allowing first walking traffic, then one lane of automobile traffic, to pass freely through the blockaded area. Anti-shale activists, as a measure of good faith, and in deference to emergency vehicles in particular, had days earlier removed two felled trees that had completely blocked off vehicular traffic. The move, of course, allowed traffic flow to resume to near normal. It also allowed unhindered access to RCMP, who as it will be made clear were scouting out the area and making plans for an ultimate take-down of the traffic-slowing, but completely peaceful, protest. Yesterday, I first heard that the roads were blocked off by someone screaming in a tented area near the entrance gate to the compound that housed SWN Resources Canada’s seismic testing equipment, in the vicinity of where I was camped. At the time, I was asleep. I could hear police beginning to identify themselves, and a rustling through the trees that suggested numerous bodies moving around. RCMP, I surmised, were everywhere, and the always possible event of the RCMP serving SWN’s injunction against blocking their equipment was upon us. SWN, the Texas-based gas company, had earlier been given a ten day extension to their injunction against the encampment, due to expire on October 21st. We had heard that the injunction had been printed in Irving-owned newspapers. Due to Irving’s collusion with SWN (the compound in which SWN’s equipment was housed, for example, is Irving-owned), there had been something of a ban on Irving newspapers. We had also been advised by various sources that peace would remain at the encampment until at least Friday, October 18th, when a public hearing against the injunction was set to occur at the Moncton courthouse. I grabbed my car keys and ran the 100-odd metres towards the Mi’kmaq Warrior encampment. The ditch opposite me was already filled with 20-odd police in tactical blue uniforms, pistols already drawn. Three police officers dressed in full camouflage, one with a short-chained German Shepherd, were also near the ditch. In the far field, creeping towards the Warrior encampment – which was comprised of one trailer and about ten tents – were at least 35 more police officers. Many of these wore tactical blue and had pistols drawn. At least three officers were wearing full camouflage and had sniper rifles pointed at the amassing group. The Warriors, for their part, numbered about 15. Through a police loud speaker towards the highway 11 off-ramp, an officer began reading the injunction against the blocking of SWN’s seismic equipment. This was all before dawn. Still in the pre-dawn dark, about seven molotov cocktails flew out of the woods opposite the police line stationed in the ditch. I cannot verify who threw these cocktails. They were – if it matters – lobbed ineffectively at the line of police and merely splashed small lines of fire across the road. A lawn chair caught fire from one cocktail. Two camouflaged officers then pumped three rounds of rubber bullet shotgun blasts into the woods. Shortly after, three so-called warriors with a journalist in tow – who claim to have arrived two nights ago from Manitoba – appeared to have determined that the situation was too extreme for them. Two of them have since been identified as Harrisen Freison and ‘Eagle Claw’. They promptly ran down the road towards the far end of the police blockade. Until last night no one had ever seen these individuals before. About ten minutes later, with tensions now becoming highly escalated between the encroaching line of police in the field adjacent to the encampment and the Warriors now on a public dirt road, two officers approached Seven Bernard, chief of the Warrior Society. They attempted to serve Bernard with SWN’s contentious injunction. Dozens of guns from all angles were pointed at all of us. Seven Bernard began to walk away from the officer attempting to serve him the injunction. If it matters, the officer in question was the same Sergeant Rick Bernard who had earlier in the summer arrested me on charges of threats and obstruction of justice – both of which amounted to nothing and were subsequently dropped. I could hear the RCMP surrounding us speaking about someone having a gun. I did not see any Warrior carrying a firearm. I can say with certainty, however, that no live round was ever fired by the Warrior side. If, as the RCMP are now claiming, that a single shot was discharged, it was not from this altercation. Before continuing, it is important to note that the Warrior encampment was on government – or Crown – land. Crown land, legally, is being held for Canada’s indigenous people, in this case the Mi’kmaq people. Through negligence of the Crown, this is often forgotten, especially by Canada’s non-indigenous populations. Equally as forgotten is the fact that none of Canada’s Maritime provinces are ceded land. The Crown is tied to the original indigenous inhabitants – and their land – through treaties of peace and friendship. Nothing more. 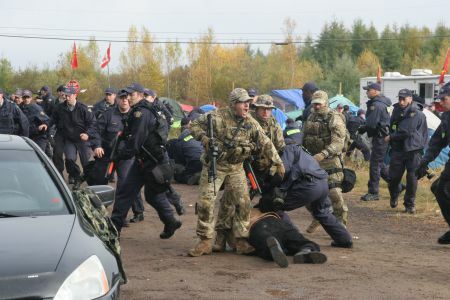 It is also important to note that the entire encroaching police formation was focused on a group of about 15 Warriors, all of whom were now on a public dirt road, away from SWN’s so-called blockaded equipment. The injunction was meant to focus on protestors blocking access to SWN’s equipment on highway 134. All of the subsequent arrests at this end of the altercation were made on Hannah Road. Why focus on a small band of Warriors, clearly away from all of SWN’s equipment and entirely incapable of reforming a blockade, with over 60 guns of various calibre drawn on them? Indeed, a van belonging to one Lorraine Clair from Elsipogtog First Nation had the evening before been removed from the compound gate. It was the main blocking factor to SWN’s – or anybody’s, really – access to their equipment. 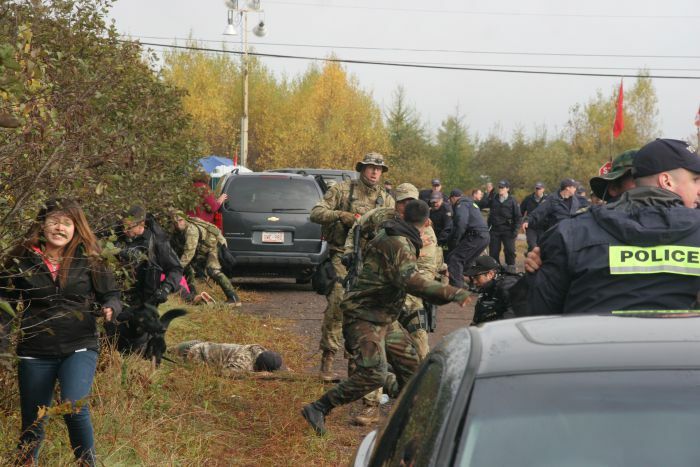 Tensions at this stand-off further escalated when a group of Elsipogtog youth began running up the dirt road towards the Warriors, and police. It is unclear how the youth, on foot, had managed to come up a back road towards a highly volatile situation. The police attempted to halt the approaching youth, for what reason is unclear. Now crying, in her hand she held a plug of tobacco, provided to her by RCMP negotiators wrapped in red cloth as a traditional token of peace the night before. Skirmishes then broke out in every direction. From the highway side, District War Chief Jason Augustine was being chased by numerous police. In front of me, everywhere really, Warriors were being taken down by numerous RCMP officers in various clothes. 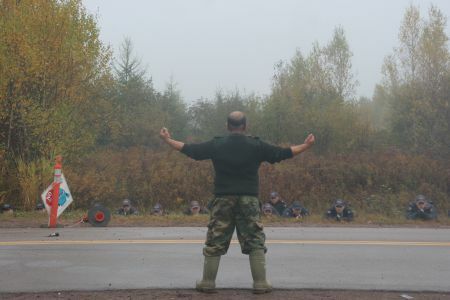 Rubber bullet shots were fired by the RCMP, and both Jim Pictou and Aaron Francis both claim that they were hit – in the back and leg respectively. I was taken to the ground and arrested. Myself and approximately 25 individuals then spent a varying amount of time at the Codiac detention centre. Some of us, apparently on a haphazard basis, were provided blankets and mattresses. Others spent about 20 hours on hard concrete. At about 12am, I was taken for fingerprinting and told my charge would be obstruction of justice, for running at an altercation (taking photographs all the while, mind you). I was refused release when I could not procure a $500 note of promise. An hour later, I was brought back to the release desk. My charge was now mischief, with conditions to stay 1 kilometre away from SWN’s equipment and personnel. I refused to sign these documents at this point, preferring to see a judge the next day. At approximately 3am I was told that all charges against me had been dropped and that I would be read SWN’s injunction and then released. I refused to sign the injunction, and at 3:15am was released into the Moncton night. I can only assume that my ever-reducing charges were due in no small amount to a public outcry over once again arresting me while covering the ongoing seismic testing story in New Brunswick. I give thanks for this continued support. Again, one must wonder at the RCMP’s pre-sunrise, decidedly violent, means of attempting to enforce an injunction against blocking SWN’s equipment. Again, one must reiterate that neither members or the Mi’kmaq Warrior Society or anyone else was anywhere near the newly-unblocked compound gate. Nor were they at all capable of reforming any blockade style formation. Again, it must be reiterated that Lorraine Clair’s van the main impediment to accessing the equipment had been removed the night before. 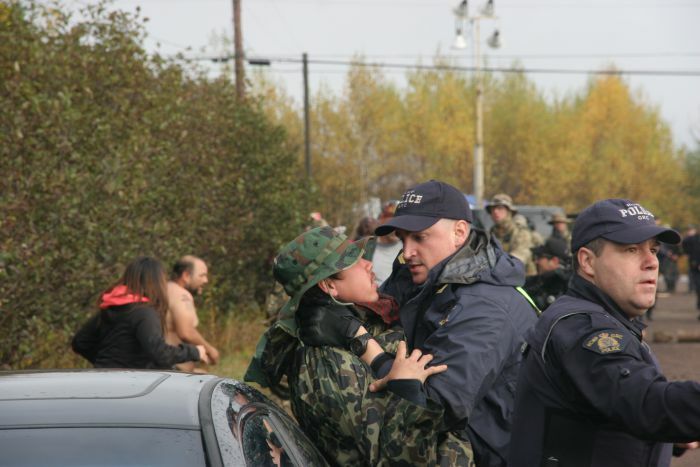 Instead, with guns drawn, the RCMP appeared intent on provoking a violent climax on the near three-week blockade. I say in no uncertain terms that it is miraculous that no one was seriously injured yesterday, indeed killed. The RCMP arrived with pistols drawn, dogs snapping, assault rifles trained on various targets, and bus loads of RCMP waiting from across the province and beyond. As solidarity actions spring up across the country, yesterday’s actions have perhaps invited a far greater climax to New Brunswickers fight against shale gas. Finally, while the mainstream media will go far to paint this as a “Native” issue, it is vital to remember that the blockade, until yesterday, had been supported by various allies from across the province. It is also key to note that an original 28 groups, representing New Brunswickers from all walks of life, had demanded an end to all shale gas exploration or development. This all occurred long before images of bandana-ed Indigenous people, who veracity as true grassroots activists and not provocateurs is now being closely examined, ever set fire to a single RCMP squad car in Rexton.